Whether you’re interested in sleeping under the stars or under water, this list has you covered. This ingenious, Swedish engineered floating island located 250 meters off the coast of Pemba Island has only three levels. The landing deck where the boat drops off guests includes the lounge and bathrooms. Climb up to the upper deck lounging area for relaxing by day or stargazing at night. The lack of light pollution allows for amazing views of the Milky Way. Guests often fall asleep to the soft sounds of the sea. 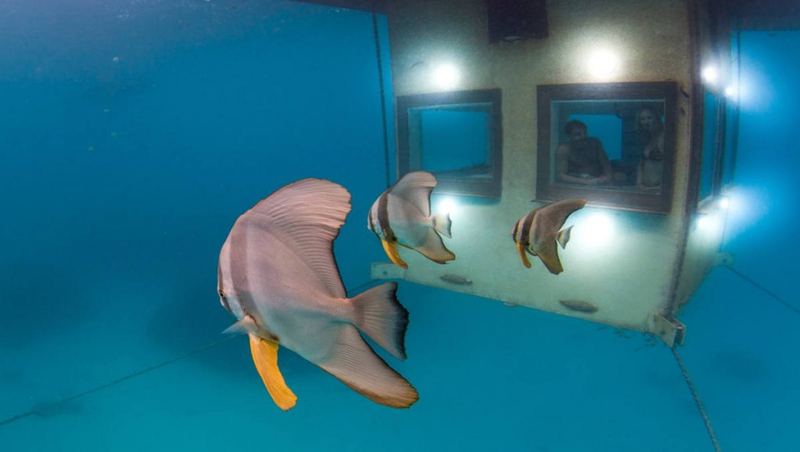 The downstairs bedroom offers a 360-degree underwater view of the sea where guests can watch rarely seen sea creatures float by. Night time spotlights even allow for viewing nocturnal creatures. Designed to give an optimal view of the Northern Lights, these glass igloos each have a double bed with adjustable headrests to provide guests comfortable viewing and the best seat in the house to watch nature’s lights dance across the sky. The insulated windows heated to keep them from frosting, and are adorned with curtains for privacy. All igloos include a kitchenette and a full bath. When it’s time for dinner, you won’t miss a minute of the show as the restaurant has an unobstructed view of the sky. Brave guests can endure freezing temperatures in the outdoor hot tub. The name translates to “the walk of the Gnomes.” Inspired by myths and fairy tales and located in a tiny 17th-century town with cobblestone streets, this Belgian hotel has 10 fantastically themed guest rooms guaranteed to delight your imagination. One room resembles a Trojan horse, while the surreal Macquarie Island room includes a bed that appears to float on water and contains a real beach with real sand. The suites are filled with starry skies, crooked windows, and wooden toadstools.